Content marketers who understand the competitive landscape are better prepared to create innovative content that drives business goals. Although competitive analysis is an essential factor in determining your content strategy, it can be a challenge to find the time to roll up your sleeves and do the research. This leaves some marketing teams bypassing the step entirely, while others outsource the process to an agency or consultant in the form of a keyword research document, a competitive content audit deliverable, or through ongoing consultation. Rather than skipping or outsourcing this process, learn the following hands-on approach to investigate your competitors’ content marketing efforts. Audience demand is the driving force behind high-performing content. Regardless of what your competitors are up to, without consumer interest, your content investment may fall on deaf ears. In order to identify demand, start by creating a rough list of topics that your audience may be interested in learning about. Even if you feel like you have a pretty good idea on what type of content to create, it’s best to connect with real customers or use cases when applicable. If you have an internal sales team, ask them what customers are consistently asking for, what terms they use when they ask, and if sales is aware of any gaps in content. Reach out to one of your customers, connect with them on social, launch a case study campaign, or even call a professional in your industry directly. Real examples can sometimes help you identify less obvious marketing opportunities. Where do you go when you need industry advice? What challenges are you trying to conquer this quarter? What do you know about our competitors? What do you like and dislike about their service offerings? Is there anything that would help you do your job better? Your line of questioning could identify areas that your competition is succeeding or lacking in with content. For instance, your direct competitors may have a terrific blog and social programs that drive exposure and awareness, and you may feel you need to emulate these to run a successful content campaign. However, through research you discover that your audience is more apt to close a deal when meeting face-to-face at industry conferences and events. Even though your online content efforts are not industry leading, this insight could give you a competitive advantage through event marketing that really drives revenue. Remember to keep any research conversations as candid as possible. The insight that you can collect in these honest, one-on-one conversations is often underappreciated. Additionally, this is an ongoing process. It’s best to always be seeking new insight from past, present and future clients or prospects. Sit in on sales calls and demonstrations and attend industry events to keep up with the competition. After conducting your initial interviews, you will be ready to begin using research tools to maximize your insight. 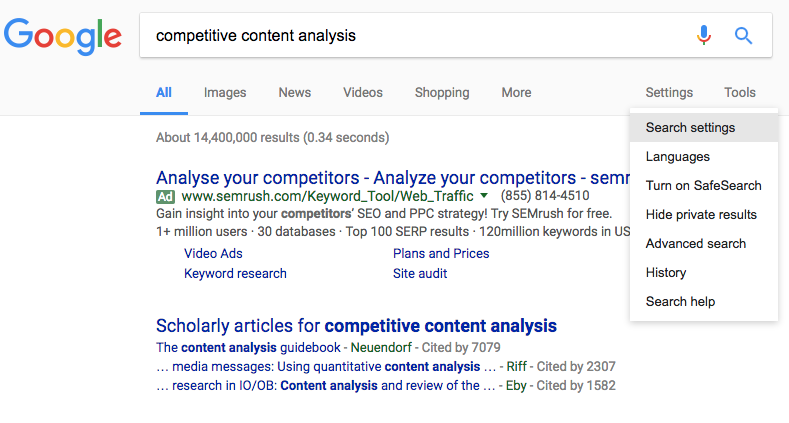 Use the following tools to research keyword terms and competitor sites. Google is the go-to search engine because Google is genuinely interested in delivering the best content at the right time to its users. Because of this, their search algorithm can shed light into customer demand and into your competitors’ content performance, strategy and search optimization efforts — if you scrutinize the search result pages effectively. It is worth noting that no SERP is alike. What works for one keyword and industry may not work for another — and as Google evolves, how it processes individual SERPs is changing. You’ll need to pay attention to stay up-to-date on your industry. This may seem like a no-brainer, but bear with me, it’s a change in mindset that you’ll need to adopt when understanding how people find content and what your competitors are doing about it. Head over to Google, select settings, and click search settings. Scroll to the “results per page” section and change the toggle to 50. This small change will help you analyze more results in less time and can save you a lot of headache while researching the SERPs later. 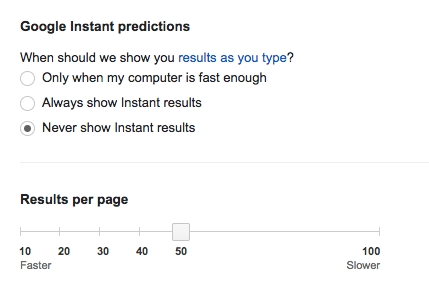 You may need to change your “Google Instant predictions” settings to, “Never show Instant Results” in order for the change to take effect. Be sure to save your settings at the bottom of the page. Start searching for a topic that is important to your ideal customers. For example, “how to build a content strategy” is important for the content marketers that I work with. Now comes the time-consuming part — read everything that Google recommends, word for word. 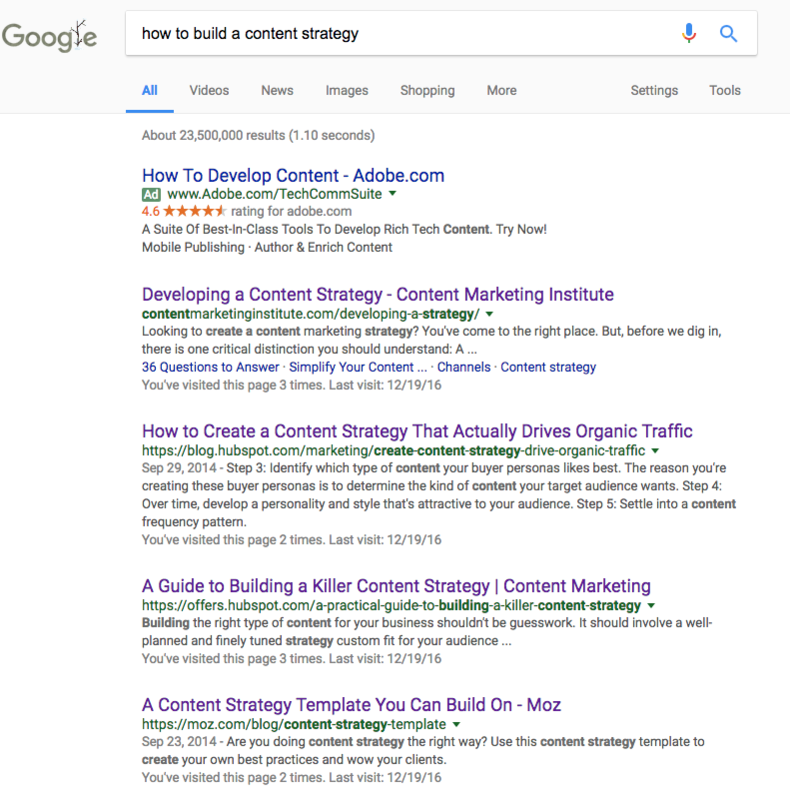 There is a reason that Google is recommending this content, so you need to become intimately familiar with Google’s content expectations. Is Google serving branded articles or third-party publications? Do videos come up in the search — or perhaps Slideshares and social channels? These details offer insight into what your customers could be looking for in content. Next, create a spreadsheet to begin documenting your research. While there are tools that will speed this up, the manual process forces you to really analyze your findings in the SERP and can help you identify content trends that you may otherwise miss. 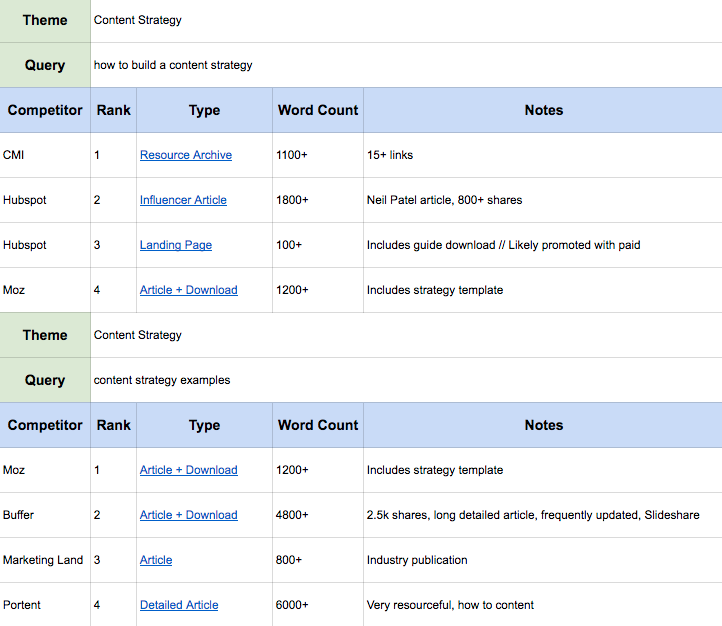 In this example, long-form written content is performing best in terms of search. This could mean that, to compete in this market, you’ll need to create very detailed articles, perhaps with the help of a marketing influencer to help with reach and promotion, and may need to include a downloadable resource. At first, start with two to three important themes that you found by interviewing customers, have collected through keyword research, or content topics that you have previously created. It can take anywhere between eight and 16 hours to fully drill into a content theme, so starting small can help you make sure that you are also concentrated on taking action from your findings. It’s also important to note that Google’s autofill feature guesses what you are looking for by sharing the types of searches that other people are commonly searching. This indicates demand — and the areas that you will need to research next. Additionally, the, “related searches” section at the bottom of the search engine result pages can also indicate similar demand. I asked search analyst Jesse Teske from YLiving, a retail outlet that’s having great SEO success in the highly competitive ecommerce space, to explain the next steps. Tracking tools are critical to establish a benchmark against your competition and provide a top-level view of who is dominating with their content strategy. Teske continues, “Additionally, by analyzing your keyword themes, you’ll get a sense of trends and opportunities to inform your content efforts. The more detailed your keyword research is, the more rewarding — and you may even find that you have been neglecting an entire segment of your audience by not creating supporting content such as blogs, infographics or other assets. The final benefit of thorough research and benchmarking is the ability to monitor your competitors efforts in the long-run. Monitor your competitors rankings by each group of keywords to see if they are actively engaging in efforts to increase their content rankings. In other words, if your competition is writing 2,000-word articles that are performing well, you will need to create content that is more detailed, longer and better-promoted.